Today I forgot how to make a paper airplane. My 5-year-old asked me to make her a paper airplane and the ones I folded were terrible. 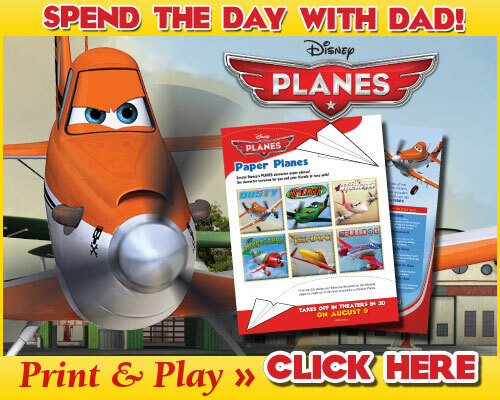 Then I remembered our friends at Disney just emailed us a set of awesome Paper Airplane Printables featuring Disney’s new movie Planes. I love that each of the six different airplanes are folded slightly differently and when you print the templates on a color printer, they look so fabulous! Julia’s favorite plane is Rochelle and Sophia’s top pick is Ishani. There are lots of ways to turn playing with paper airplanes into a learning activity. Measure the distances the planes fly. For older children, convert the measurements from metric into imperial or the other way around. Compare the distances using subtraction and write out the mathematical equations. Introduce the topic of physics and depending on your children’s age, discuss aspects of flight. Use these Disney’s Planes paper airplane templates to print, fold and fly the best paper airplanes. We had such fun playing with these paper airplanes. I was amazed how far and fast they flew. My girls are now counting down the days until Disney’s Planes movie hits theatres. Click Here for More PLANES Activity Sheet Printables. Disclaimer: This post was not compensated, but we do occasionally attend Disney media events. Find more fun craft ideas for your children on our Activities for Preschoolers Resource Page. Also, if you’ve published a post with your own craft ideas, link it up on the resource page! has helped me out loads. I’m hoping to give a contribution & aid other customers like its helped me.